At least 76 people have been injured in Madrid as clashes flared up between protesters and police, the latter using rubber bullets. Thousands of Spaniards turned out against new cuts introduced by the government. 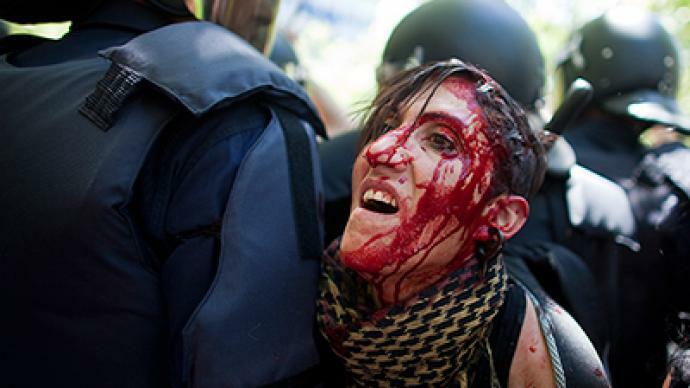 Those injured include 33 police officers and 43 protesters – miners and their supporters. Minor arrests have been made so far, with eight people being detained. Three of those arrested reportedly threw bricks at police, local El Pais newspaper reported. The police have confirmed that there were no miners among the arrested. Protesters panicked and sought shelter as police began to disperse the crowd, Olvidio Gonzalez, 67, a retired miner from the northern Asturias region told AP. Witnesses and demonstrators claim that police started the attack without any warning. "We were eating quietly when they began to appear with several police vans. Then we started to shout and some threw a few bottles, which gave rise to the charge," Hermann, a miner from the small town of Langreo in northern Spain, told El Pais. About 200 people remained surrounded by dozens of police in front of parliament, Twitter user Danips posted on his microblog. Some media reports suggest a spontaneous demonstration flared up in front of parliament. 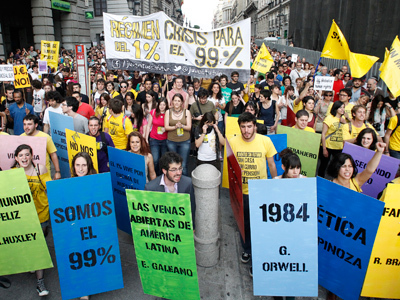 Protesters are calling on Spaniards via Twitter to join bigger protests at 19:30 local time. Protesters disagree with a 63 per cent cut in subsidies to coal mining companies, major contributors to the Spanish energy market. Unions say the plan threatens 30,000 jobs and could destroy their livelihoods. 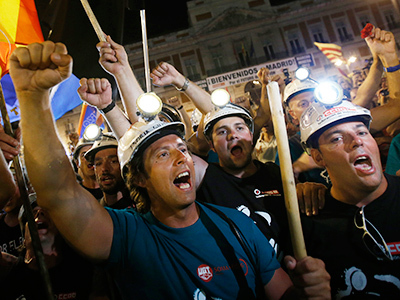 Miners, who were hiking from the north of the country for the past two weeks, have been joined by tens of thousands of Spaniards also protesting against Prime Minister Mariano Rajoy’s tax hike. The prime minister announced his decision to raise VAT by 3 per cent as part of the plan to trim the public budget by 65 billion euro over the next two-and-a-half years. Rajoy also declared a 3.5-billion-euro cut to local government spending. Many protesters marched more than 400 kilometers (250 miles) from mines in northern Spain. As protesters call for more demonstrations to make their voices heard journalist and writer Miguel-Anxo Murado told RT that the government seems to underestimate the protests. “They think they can cope with these protests partly because mining regions are localized in certain areas of the country. These are small areas. So they think that this will not affect the rest of the country. The truth is that the miners are getting a lot of solidarity because many people relate to them and see their problems as their own problems,” he said. Carlos Delclos, a sociologist at Pompeu Fabra University in Barcelona, is strongly critical of the role of Spain's prime minister in the current crisis. He believes that the Spanish government’s actions, including its reaction to the protests, results from the long-lasting culture of impunity. “What we are seeing is the impunity of a government that has a lot of people that pertain to groups that had affinity with the Franco government, the Fascist government, 40 years ago, and have never had to sit before trial since then,” he said.